Former Afghan President Hamid Karzai believes that Washington should focus on cutting down extremists’ financial sources and training ground. The United States should cooperate with Russia, China and India in order to defeat international terrorism, former Afghan President Hamid Karzai told the RT broadcaster in an interview published Wednesday. 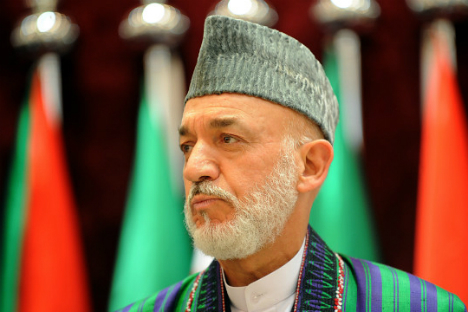 Karzai has arrived in Russia to participate in the two-day annual Moscow Conference on International Security (MCIS), which starts later in the day. The agenda of the MCIS includes struggle with terrorism, as well as security challenges in the Middle East, Asia-Pacific, Europe and Central Asia. "If this war is genuinely against terrorism, if the United States wants to succeed, then we know by now that success will not come unless you go to the sanctuaries, you go to the financial sources and all other factors… And if you cannot do it alone, then go seek help from Russia, China and India. In particular, Russia, in our case, because it is close to us, because it has a long history with us, and because it has the means to do it, together with the rest of the world," Karzai said. Afghanistan is experiencing political, social and security instability, as the Taliban Islamic movement and other radical extremist organizations such as Daesh, which is prohibited in many countries, including Russia, continue to stage attacks against civilian and state targets. Formed in the 1990s, the Taliban seeks to enforce Sharia law in Afghanistan and neighboring Pakistan.